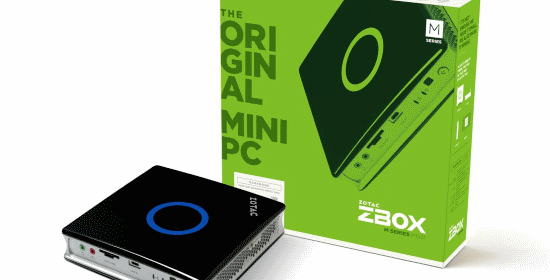 Very few OEMs have embraced the SFF like Zotac with their Zbox line of mini-PCs, so it’s great to see them expanding the lineup with Skylake. It looks like they’ve opted to start with a very capable CPU; the 35W quad core Intel Core i5-6400T. The good stuff doesn’t stop there however, with M.2, a 2.5″ drive slot and support for up to 16GB of DDR3L packed into the ZBOX-MI551-BE. Meaning you could barebones your way into a very capable HTPC system. The future of desktop computing has arrived in ZBOX MI551. Packing a dimension of new technologies into the same compact-sized housing, the MI551 is designed to perform any computing tasks effortlessly while having performance left over for high octane entertainment. The MI551 powers your productivity and entertainment with a 6th Generation Intel Core i5-6400T, integrated with Intel HD Graphics 530. Designed for Windows 10, you will be able to experience a plethora of new features and fully unleash the power of both CPU and graphics with DirectX 12. The MI551 brings data transfer speed up a few notches with the revolutionary USB 3.1 protocol, giving you up to 10 Gbps of data transfer rate, giving a new meaning to speed.